Chapter 24 and Electric Dodo UK come together to share their musical vision and extend the boundaries of entertainment once more by booking another first for the UK. 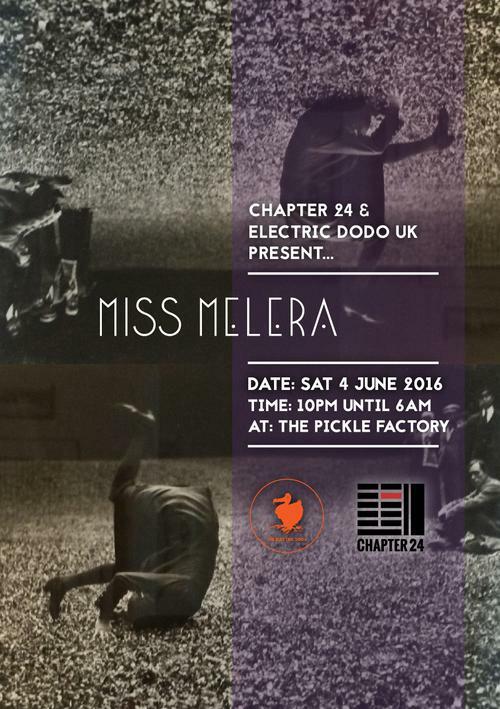 Join us at The Pickle Factory on Saturday 4th June for a night headlined by the highly-regarded Dutch artist Miss Melera, with support from Chapter 24 and Electric Dodo residents. For the past decade, the Amsterdam-based Miss Melera has been perfecting her art and developing her mixing skills. She’s done her homework, absorbing the essence behind traditional genres such as deep house, tech house and techno and then twisting them into a melodic confection that is both fresh timeless and completely her own. A triple threat, Miss Melera is as at home in the studio as she is on the airwaves, in the DJ booth at an underground club or on the stage of a huge outdoor festival. In the past year she has played high profile dates in Europe, India and the Americas. Her monthly radio show, Colourizon, is increasingly popular and her fast-growing fanbase is embracing her latest release, 'Magenta', on Chapter 24 Records. Her third EP - which follows 2014’s 'Faith' on Einmusika - includes the title track, a second original, ‘Mint’, and excellent Editions by Dave Seaman and Jonas Saalbach. The venue for this party is The Pickle Factory. Launched by the team behind Oval Space - and located directly opposite it - this state-of-the-art venue is designed specifically with music in mind. A room within a room, the space is engineered like a recording studio, ensuring unrivalled sound reproduction. With minimal frills and stripped-back lighting, the focus is on the soundsystem: a new breed of d&b audiotechnik V series point source loudspeakers. This is a rare opportunity to see Miss Melera play for the very first time in London, in an intimate space for music lovers. Capacity is limited to only 200, so grab your tickets early to avoid disappointment!